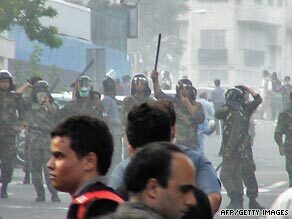 Iranian riot police block protesters on a Tehran street in June. Friday, September 18, was Quds (Jerusalem) Day in Iran. It was first announced 30 years ago by Ayatollah Khomeini to express solidarity with Palestinians. But on this day last week, national TV showed little of the government-organized rallies around the country. The coverage was limited because any attempt at showing the demonstrators was bound to show the green marchers, protesting the results of the June 12 presidential election. The protesters chanted “Na Gaza, Na Lobnan, Janam fadaye Iran,” (No Gaza, No Lebanon, I die for Iran). The story of chants, mottos and slogans (shoar in Persian) dates back to the early days of the revolution in 1979. But the unexpected turn of events after the recent presidential election have revived the power of this revolutionary tradition and demonstrate the ever-changing nature of political culture in Iran today. For one month preceding the Election Day on June 12, young Iranians – who compose the majority of the country’s population – poured into the streets all over Iran to campaign for their presidential candidate. The four presidential candidates were Mir Hossein Mousavi, Mehdi Karoubi, Mohsen Rezaie and Mahmoud Ahmadinejad, who had been approved by the Guardian Council, an unelected body of jurists and clergies. The young men, accompanied by an unprecedented number of young women, demanded more freedom, improvement of economic conditions and better relations with other countries. What started as a silent march to get back their stolen votes gradually became a movement – known as green movement – to demand civil and political rights. Much like the bloody days of the 1979 revolution, sounds of bullets and the smell of tear gas in the streets replaced the euphoric atmosphere of pre-election days. When the advanced military of Shah opened fire on the people in the streets demonstrating against the reign of Shah, the demonstrators shouted back then (Toop, Tank, Mosalsal digar asar nadarad) “Canon, Tank, Machine Gun will not be effective anymore). In June 2009, marching amidst bullets and tear gas, demonstrators shouted (Toop, Tank, Basiji, digar asar nadarad) “Canon, Tank, Basiji will not be effective anymore”. Basiji refers to the militia men, or rather teenage boys who had volunteered in the 1980s to fight the Saddam’s army during Iran-Iraq war but are now recruited and ordered to suppress demonstrators who the authorities refer to as “internal enemies of the state”. In a televised appearance a week after the Election Day, Ahmadinejad referred to the demonstrators as (khas-o khashak) “rift-raft” and described them as “soccer fans who are upset because their team has lost”. During demonstrations in 1978 and 1979, the anti-Shah demonstrators chanted “Azhari Goosaleh, bazam migi navareh? Navar ke pa nadareh!” (Azhari, the donkey/ calf, you say again that it is a tape? The tape does not have foot!) This was in direct reply to Major General Gholam Reza Azhari, the prime minister at the time, who said in the parliament that the shouts of Allah-o-Akbar (God is Great) loudly heard in the streets of Tehran and other major cities were the sound of tape cassettes-much like Khomeini’s sermons distributed on cassettes- that some traitors play loudly at nights. In 1978 and 1979, when Ayatollah Khomeini asked Iranians to march peacefully in the streets and give flowers to the military personnel, he employed the most effective tactics of non-violent struggles previously used by Ghandi and Martin Luther King, Jr. Whereas the military fired shots on the demonstrators in 1979, the demonstrators chanted (Artesh jenayat mikonad, Shah hemayat mikonad) “Military commits crime, Shah supports it”. In 2009, the demonstrators who had witnessed shots fired from rooftops of Basij stations in Tehran killing un-armed and defenseless demonstrators, they shouted (Basij Jenayat mikonad, Rahbar hemayat mikonad) “Basij commits crime, Supreme leader supports it”. On the fortieth day of protests, a newly formed committee of Mournful Mothers of Iran gathered at the graveside of Neda Agha Soltan, who was killed in the streets of Tehran during the protests. The committee chanted (Nirooyeh Entezami, Sohrab baradaret koo?, Neda Khaharet koo? Nedaye ma namordeh, in jomhouri ast ke mordeh) “Security Forces, Where is Sohrab, your brother? Where is Neda, your sister? Our Neda (also means our voice) has not died, it is the Republic that has died”. Perhaps it is one other ‘shoar’ among a long, still-evolving list of mottos/shoars that sums up the current crisis. This one is aimed directly at president Mahmoud Ahmadinejad who prided himself on his ability to unify Iranians for the nationalistic goal of achieving nuclear energy. Editor's Note: Elham Gheytanchi teaches sociology at Santa Monica College. She writes about Iranian culture, politics and media. Her research focuses primarily on women’s rights in Iran. The Israelis & their supporters have no reason to be excited on the matter. It was an attempt to divert the attention but it did not work & it will never work in the long run. Money can buy minds for a while but not for ever.Iranians will never gave up until Pelestine occupation ends finally & parmanently Pelestinians movement of FREEDOM will prevail. Al Quds day will remain as long as it is required.So called International community will fail to blackmail the real world. Again ,Money can not buy the thrust of Freedom. we need to stay out of their business, and others business, and worry about our economy and our soldiers who are dying in two wars. Until we bring them home, I don't want to worry about any other countries agendas. An excellent piece of writing and I'm glad to have read it. I wonder about the differences in attitudes towards the Republic in rural Iran as compared to the major cities like Tehran. Thanks for the opportunity to have read this. Hi Anderson Cooper, I like the way you anchor the news. Gosh,I just had a flasback to 2000 elections in America,boy that was close,...?